Are grants based on peer review becoming a thing of the past? Could science be moving towards a crowdsourced model? Crowdfunding is the alternative finance model adopted by innovators to raise capital crowdsourced from pools of investors. It is gathering momentum as a new source of funding to complement the usual sources of public funding from research councils, government agencies and NGOs. As science-only crowdfunding platforms proliferate (Crowd.Science, Experiment.com and others), and traditional sources of funding are increasingly over-subscribed in the current economic climate, scientists are following entrepreneurs to get their good ideas funded. The approach generally involves pitching an idea or project in a public campaign, to which backers respond by donating money in return for an incentive. I was the first scientist to crowdfund science at the Royal Botanic Gardens, Kew, where I’m a researcher, and the stakes were high. However, with confidence in my idea, support from senior scientist colleagues, and assurance from the UK’s first science-only crowdfunding platform that this was a project worth campaigning for, I went ahead. 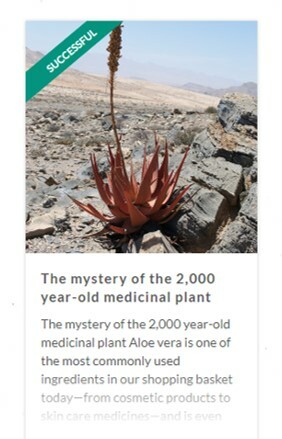 My campaign was for a phylogenomic study to investigate the origins of Aloe vera, a species which supports a global natural products industry. By selecting a charismatic plant and a question that could lead to sustainable industries using other species of Aloe in Africa, Madagascar and Arabia where they grow naturally, the project provided a tangible study and a bigger picture that backers could relate to personally. Besides my much-valued scientific collaborators, I was fortunate to have the support of a multidisciplinary team of fundraising and media experts from within my organisation, without whom my campaign would have required substantially more work and may not have succeeded. We planned the social media, publicity and events to complement other events at Kew, and offered incentives that ranged from a postcard to personal tours of the research facilities and botanical collections soon after the campaign ended. It was a great success (we exceeded the target by a third), and thoroughly worth the step into the unknown. We are currently analysing the data and we’re on track to write up the findings later this year. As promised to our backers, they will be acknowledged collectively in all outputs from the project. Have a good idea or a terrific story: Your research idea must be too good not to be part of; your backers must believe in your ability to make a defined step forward. Safety in numbers: You will need support from colleagues, friends and family to help with publicity and in delivering the goods. Run your campaign as a relay team if possible. Engage the expertise of the science support teams at your institute, and friends who may have experience with publicity and science outreach. Be prepared to answer difficult questions and, unfortunately, to deal with trolls online and unwelcome correspondence. Have a plan and be flexible: Your success will depend partly on your ability to adapt the campaign as it progresses to suit the mood on social media and the opportunities that arise while it runs. Plan to measure success at certain intervals and make snap decisions if necessary. Expect to be away from intensive commitments such as lab work or analyses while you’re responsible for the campaign; you will be spending a lot of time on social media. A solid platform: There are laws about the handling of your backers’ personal data and the funds donated. Use a platform with credible experience and a reliable pay channel, and get advice from your institute about how to get this right. Think about whether you want to use a science-only platform or a general crowdfunding platform where you will likely reach a wider audience but compete with many more projects for backers. Get creative with incentives: Consider who you’d like to reach with your campaign. Offer a wide range of incentives to accommodate the means and interests of prospective backers. Make sure you can deliver the incentives to your backers regardless of the total sum raised.